3)Press firmly into pie pan and bake at 350 for 10 minutes. Cool. 1 cup vegan choc chips melted or chocolate shavings, mint leaves, etc….as garnish. 1)Blend silken tofu until smooth in processor. 2)Melt chocolate bars and 1/2 cup choc chips in microwave until smooth. Stir every 30 seconds to prevent burning. 3)Pour melted chocolate into processor with tofu. Blend until fully incorporated. 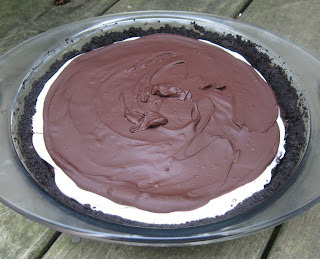 4)Pour chocolate mixture into crust and chill until firm (about 2 hours). 5)To make mint crème layer, blend tofutti cream cheese with EB. 7)Slowly blend in powdered sugar 1/2 cup at a time. 8)Spread on top of chocolate layer and chill. 9)Drizzled on melted choc chips as garnish.